Horror films have long plumbed the dark recesses of womanhood. In an industry where women haven’t historically been afforded equal opportunities, a litany of actresses have earned the limelight portraying vulnerable protagonists, preyed upon by sinister, sometimes supernatural forces serving as allegory for sundry societal woes, from patriarchal oppression to sexual repression. The roster includes Jamie Lee Curtis in Halloween, Mia Farrow in Rosemary’s Baby, Sissy Spacek in Carrie, and Catherine Deneuve in Repulsion. I thought Essie Davis deserved an Oscar four years ago for her lead performance in The Babadook. 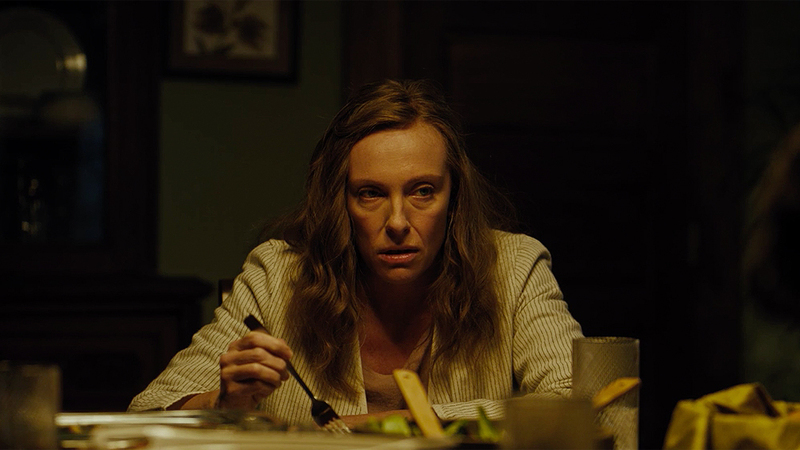 Add Toni Collette to the long roster of horror heroines in Hereditary, as she gives a career tour de force as the psychologically tormented daughter of a deceased, unkind matriarch. For his salutatory genre entry, director Ari Aster blends the specter of women as victim with Asian horror, which is more steeped in depictions of the monstrous-feminine. The film opens with an obituary, and the cloud of death never relents over the entire ensuing two-plus hours. It’s clear from the jump that Annie (Collette) was estranged from her recently deceased mother, unlike Annie’s dead-eyed youngest daughter, Charlie (Milly Shapiro). Annie’s older son, Peter (Alex Wolff), appears haunted by some hidden grievance, while Steve (Gabriel Byrne), Annie’s suffering husband, just wants a family that’s normal and together. As Annie busies herself making macabre miniatures that reflect real life, Aster gradually pulls the threads of her tortured psyche, revealing a long family history of psychological anguish that might just be Annie’s birthright. Unspeakable tragedies (past and present) cast Annie into further emotional breakdown, with the lone mystery being her culpability in the family’s crippling, spiraling dysfunction. Many traditional horror tropes are fully deployed: the occult, the poisoned bloodline, mental illness, familial angst, spiritualism, and just a dash of sexual damnation. It’s all stuffed into an eclectic package whose mood borrows heavily from both K-horror and Hammer-esque Victorian Gothic. Other obvious visual and thematic influences range from Kubrick’s The Shining to The Innocents, in which Deborah Kerr played another woman who fears that evil has infected the family in her care. Aster doesn’t lean on many easy cheats like jump scares and creaky floors. Instead, he saturates the screen with a measured, unrelenting foreboding. Instead of shrieks and screams, Aster knows he can exact more dread from his audience by repeating the sound of Charlie clucking her tongue. Wolff deserves much merit for his turn as a teenager trying, and failing, to cope with the fallout of a mad (in every way) mother and the horrible aftereffects of a meddling apparition—Peter’s drained, beleaguered visage ultimately mirrors us all. But it’s Collette who sensationally channels an innumerable array of emotions, from sorrow to anger, lunacy, and even farce. The final act teeters on the edge of Grand Guignol overload, and allusions to the occult become too tangible, undercutting the otherwise complex characters studies. But it all ends without mercy or redemption, just like a good horror film should. As the film’s title suggests, Hereditary passes down its sense of fright, and we’re all the beneficiaries.